Come See What's Cooking: Announcing Our New Culinary Literacy Center! The Free Library of Philadelphia launched its new Culinary Literacy Center and state-of-the-art demonstration kitchen, sponsored by Cancer Treatment Centers of America, this morning at the Parkway Central Library with the help of two of Philadelphia’s most acclaimed chefs: Jose Garces and Marc Vetri. 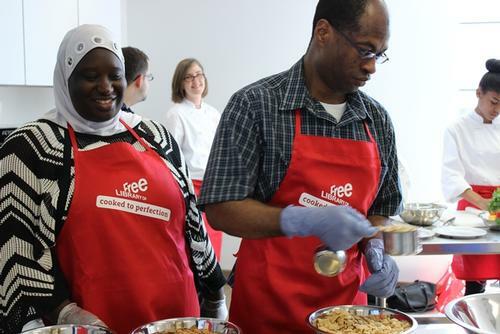 As part of the Culinary Literacy Center kickoff, some of the Library’s many culinary literacy partners hosted interactive stations that focused on different aspects of cooking and nutrition. 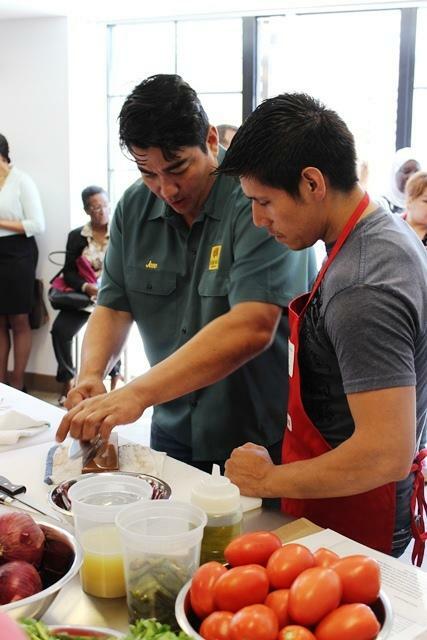 Plus, Chef Garces and Chef Vetri helped lead a group of community members and non-native-English speaking restaurant workers through a knife-skills class, highlighting the intersection of cooking and literacy. By using cooking to teach reading (recipes), math (measuring), and even chemistry (what happens to the food when it goes into the oven), the Library will provide an array of innovative—and delicious—programs that help develop literacy and problem-solving skills. The Culinary Literacy Center will also allow the Free Library to host workshops on nutrition, courses on budgeting and cooking for healthy living, and public classes and demonstrations. The Free Library is excited to work with its many community partners to bring the Culinary Literacy Center to life, including the Garces Foundation; the Vetri Foundation; the Careers through Culinary Arts Program (C-CAP), a vocational program for high school students; Drexel University’s Center for Hospitality and Sport Management; the Mayor’s Office of Sustainability; Penn State Extension’s Nutrition Links; The Supportive Older Women’s Network (SOWN); the Center for Literacy; and more. For a full schedule of culinary literacy programs at the Free Library, check out freelibrary.org/cook! 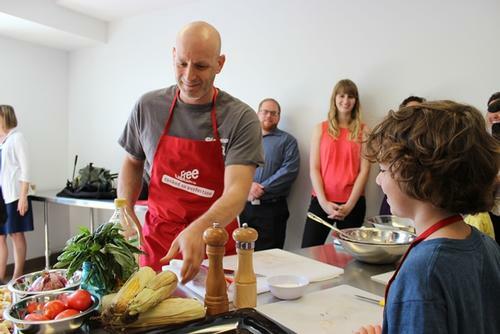 Marc Vetri works with a budding young chef. Jose Garces demonstrates proper technique. Culinary Literacy Center participants prepare their sample dishes. When will you have classes for Adults in the Culinary Literacy Events? Everything you have so far is for children & teens. I WOULD LOVE TO COME AND WATCH THE CLASS PREPARE MEALS. We are working every day to keep adding classes for all ages in our Culinary Literacy Center. Right now we have classes available for children and adults. Visit freelibrary.org/cook for the full schedule! I just learned of this from PCCY board member - Awesome! I am running a school-based food & nutrition education pilot out here in the burbs we call "Fifth Grader Approved Foods" and would love to connect with someone from this project. Please reach me with a contact - Rich (at) xVenturesGroup.com "Fifth Grader Approved Foods" "An innovative unit of study that invites students and teachers to create fun, nutritious food recommendations and share them with their parents and community through a web app." Add a Comment to Come See What's Cooking: Announcing Our New Culinary Literacy Center!